We’re at The Neon in Newport for Welsh boxing’s first show of 2019. British Warriors get the year underway with their six-fight show. Tonight’s instalment of action is headlined by Kieran Gething and Henry Janes, who will both bid to become a British champion at the second time of asking. The super-lightweights are supported by five other match-ups, including tests for hometowner Craig Woodruff and West Walian Angelo Dragone. The contest was put together at the last minute but saw Jenkins record his landmark 20th professional victory, the first in over 12 months. Jenkins took his time and stayed a step ahead throughout, landing consistent jabs and stepping in with power shots whenever Pupluaskas showed any ambition of causing an upset. 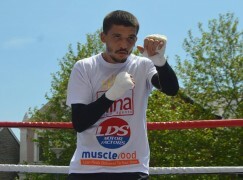 The 30-year-old super-lightweight is a former WBC International and Prizefighter champion. A return to winning ways could put him in the picture for more significant title contests. Carmarthen’s Angelo Dragone (3-0) earned a solid points victory against Cardiff’s game Rhys Saunders (3-15-1, 1KO), pounding out a hard-fought 60-54 decision victory over six rounds. The lightweight began brightly, bouncing at range before darting in with short bursts. Saunders, formerly managed by his opponent’s trainer Richie Garner, stayed compact but his eagerness to close the distance saw him walk on to Dragone’s two-fisted catch-and-counters. The pair shared more even exchanges at the start of the second round. However, Dragone was more active and began to make his mark by the middle of the session. Saunders started to battle a bloody nose and his efforts to stay close to Dragone backfired – instead resulting in the receipt of a series of two-fisted flurries. 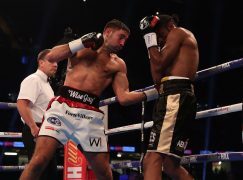 Saunders became more bullish in the third round and the introduction of a jab as he came forward opened Dragone’s defence more frequently than he’d managed before. The success was short-lived and Dragone’s more accurate shot selection saw him land several eye-catching left hooks in the fourth round. Although Dragone remained the more accurate, the action had still been exciting as they entered the fifth round. The unbeaten prospect was welcomed to the unknown territory with several free shots, Saunders surprisingly affording him a brief opportunity to unload on an unprotected face. The display of bravado wasn’t enough to turn the tide and tempt Dragone into reckless exchanges. Dragone’s discipline kept him on-mission and secured a very respectable win for his third professional outing – arguably the best display he’s given in the paid code, too. Tonypandy’s Rhys Edwards (3-0) has shone brightly since entering the professional pool and his third outing was no exception as he bullied Simas Volosinas (7-85, 1KO) from pillar to post on his way to a dominant 40-36 decision win. The super-bantamweight stuck to his Lithuanian opponent like glue, rarely giving him a yard of space to retreat to. Edwards, trained by Gary Lockett, was fighting in his home country for the first time without a vest and he clearly enjoyed the occasion. 18-year-old Edwards got to grips with things from the off, firing solid straight shots and following them up with meaty body shots. There was little for him to avoid as Volosinas’ was forced to tuck-up for his own safety and survive. Always busy, Edwards did still manage to show some quality composure. He rarely threw more than three or four punch combinations before resetting, which ensured Volosinas didn’t know when, or where, the next phase was coming from. Edwards was vicious in the third round, punishing Volosinas with heavy power-punches, especially uppercuts and screw shots on the inside. The visitor was always off balance and unable to throw any deterrent towards Edwards, who was in full flow and producing eye-catching pivots from side to side until the final bell sounded. Barry’s Maredudd Thomas (5-0, 2KO) continued his unbeaten streak and collected a 40-36 decision victory against Bulgaria’s negative Petar Alexandrov (3-6, 2KO). The welterweight owned a significant size and reach advantage and he knew it, using the long leavers to negotiate Alexandrov backwards from the first bell. Seizing control of the pace early on, Thomas progressed forward in a menacing manner and soon measured his favoured right cross, which landed on the button at the bell to end the opener. Thomas continued to press in the second round but was guilty of waiting too long, affording Alexandrov opportunities to spoil the action. It was a pattern that continued in to the third round, too. Thomas was undoubtedly producing the better punches, though his efforts were routinely untidied by a scrappy response from Alexandrov. The success came more clearly in the fourth and final round. Thomas began to lower his work, under instruction from Gary Lockett, and uppercuts and body shots slowed Alexandrov’s speedy spoiling, extending the Welshman to the final bell for the first time since last April. The second chapter of Newport’s Craig Woodruff (7-4, 2KO) is gathering momentum as he was welcomed home with an impressive 60-55 decision win against Durham’s dangerous Jordan Ellison (11-20, 1KO). Woodruff is one of the longest lightweights you can find and he used all of that reach in the opened, whipping jabs from his waist to judge the range. Ellison stayed calm and compact, using all of his 30-fights of experience to take a good look at Woodruff in the opener. The two met in a more head-on fashion throughout the second round. An overhand right sent spray from Woodruff’s hair and he grinned in response, pushing forward to reply moments later. They took turns to trade but it was the Welshman’s work that stood out and seemed more spiteful. Woodruff planted his feet with more meaning in the third round. An assortment of left hooks and straight rights, sometimes delivered in reverse, landed clean and the only interruption to their flow came when Woodruff fouled in a messy clinch. Ellison enjoyed a spell of success in the fourth round, catching Woodruff when he held his head too high. Eager to stop a potential rot, Woodruff reclaimed the initiative in the fifth round, reintroducing his jab and stepping forward to exchange with more urgency to close out the contest. 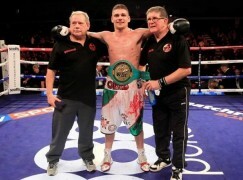 It seems an age ago since Woodruff won a Welsh title in 2013 and was then rushed to fights against the country’s best. Thankfully, his new handlers are keen to move him in a more career-friendly manner, also taking steps to raise his profile in his native city. However, based on this performance, more domestic showdowns and Welsh-derbies may soon be on the agenda. That’s because during Ellison’s last visit to Wales, he proved a stern test for Rhoose’s eventual victor Lance Cooksey – who has also appeared on British Warriors’ shows and, in the eyes of many fans, is a suitable opponent for Woodruff. Pontypool’s Kieran Gething (7-2-1, 2KO) was crowned Welsh super-lightweight champion after a relentless 100mph effort against Cardiff’s gutsy Henry Janes (12-24-3, 1KO), taking a 99-92 decision victory. The were frantic exchanges in the first and second rounds. Each took their turn to lead the action and there was little to separate them as they matched the other punch-for-punch. Janes appeared to land more head shots, whilst Gething put his early work to the body, especially with his favoured left hook. The first sustained spell of success came in the third round as Gething got a foothold in the fight. 35-year-old Janes was retreating with more haste and relying on single shots to deter Gething’s flow, who was pushing the action to the edges of the ring. 24-year-old Gething piled on the pressure in the fourth and forced mistakes from Janes as he squared up on the ropes. The younger man took advantage, uncorking a cracking right cross to send Janes’ head backwards, though a sneaky uppercut from Janes in the final 20 seconds served as a reminder that he was still in the contest. Seemingly aware that he needed to reply, Janes made a real effort to halt Gething’s relentless approaches in the fifth round – and he did, landing a few flush left hooks. It resulted in furiously frantic exchanges and the punch count was sent through the roof. Both were in fifth gear but it was Gething who remained in the driving seat. The pace slightly slowed in the seventh round, the exchanges more evenly spread out. It was at this point that Gething’s jab stood out, effective in giving him a yard of space to step in to his heavier shots. Janes’ hooks remained active but their success dipped amidst constant waves of attack. A small mouse appeared under Gething’s right eye as they entered the ninth round. His vision was unaffected, though. A non-stop effort put Janes in to dangerous territory and there were brief moments that made for uncomfortable viewing as the veteran aimed to stay competitive, smothering Gething’s relentless attacks. 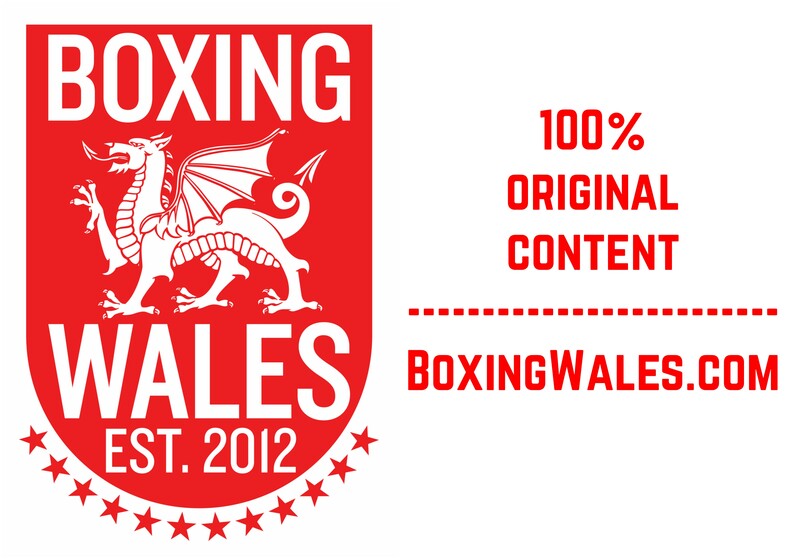 The final round played out in a similar fashion, capping one of the most entertaining Welsh title wars in recent memory. Gething is one of the most ambitious boxers on the Welsh scene and signing with MTK Global has raised his profile in domestic circles. Janes was once bordering on journeyman status but on returning from a six-year break in 2016, the proud traveller has fought stellar opposition in the away corner, often causing unexpected upsets. It was a second chance for the both of them. 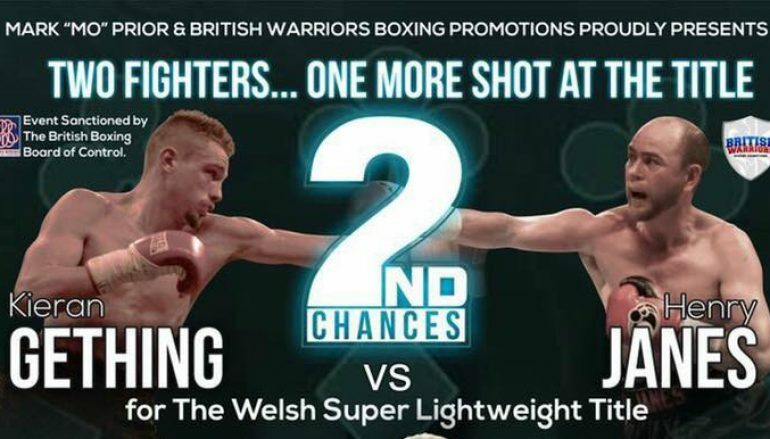 Janes lost a vacant Welsh title fight against Gavin Gwynne in 2017, whilst Gething came up short by just a point against Tony Dixon for the welterweight version in October.